Storms signify change in my mind. A raging movement of pressure interacting with the environment. Be it inside our head or outside of our body, they work in the same way. A rainbow brings with it the signal of hope. The darkness that has succumbed us, or is about to, interacts with the light as it finishes its long journey from the sun, finally splitting into all its various frequencies and making one last show for us to enjoy. I adore how the colours dance against the dark moody blues. We so often think of them as sitting only in arcs across the sky, yet if we really look, they so often appear in these small forms. Nestled against the horizon, or deep in the heavens above. It just goes to show that something doesn't need to be large and bold to bring real change. Often the small glimmers are the ones that mean the most. 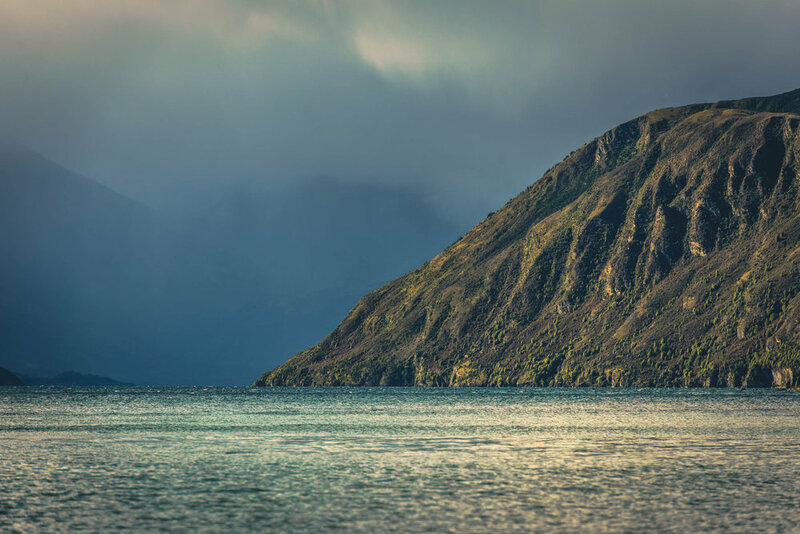 The head of Lake Wanaka offers incredible vistas on a day by day basis. The oncoming fronts of weather, having raged across the Southern Alps after building over the Tasman, play out their final acts as they reach the water's edge. From only a few kilometres away we get to watch as these scenes unfold. Upon this occasion, I was alerted by a good friend of yet another 'Kodak' moment. Can you see the silver shimmer to the light and the water? The way the pressure shift has pushed the waters surface into an eerie flat expanse giving the reflected diffused light the perfect surface to dance across. The fluffy clouds catching those stray rays of light, whilst not that much further away the gloom of the storm rages in full. There is so much power sitting their, hidden under the dense veil of moisture, would we even want to see within if we could? Or are we just pleased that we can only view the delicateness of what lies on the edge. The junction between the storm and the calm. I'd never really heard of French Pass until I found myself being driven along one of its ridges amidst a raging storm. The first of the year to be exact. It was almost like the weather gods wanted to start the year off with something to remember, and boy oh boy did they pull that one off. The Cook Straight crossing was interesting to say the least. A cross shore breeze of 50 knots or so added excitement to our mornings nautical adventure. As we were amongst the howling winds, nestled inside a huge tub of steel, our perception of our surrounds was visually restricted, yet easily felt in many other ways. The feeling of having our feet back on steady ground was one of joy, yet this wasn't set to last. This ridge, the gateway into French Pass, it held different ideas for our passing. For the most part, our vision was as restricted as it was out on the straight, yet every now and then, out it popped. The full force of the storm parting ways and allowing us to really see. The beauty that lay below, blanketed beneath the tumultuous skies. The light bouncing off countless water molecules as they were bullied around the bays by the tireless wind. There’s something about the light that breaks through those clouds. The blues appear to be left in the remnants of the water molecules in the sky and the reds make it through, it’s almost as though the blues have gifted their energy to them so they can shine even brighter. When we’re right in the middle of it all I rarely find the motivation to leave the warm dry confines of home. Yet, as the storm starts to dissipate, it’s as though my alert beacons begin to flash. In those early moments as the light changes, a result of the parting storm, the sights I witness blow my mind. Driving along the lanes, stopping erratically, jumping out of the car in the hopes that my trigger finger will be fast enough to capture these fleeting moments, this is commonplace on these days. I feel alive, invigorated and in pure wonder of this world all around. The bold colours, the strong contrast and the subtle details, these all represent what’s really going on inside. It’s the creaminess of the light diffused by those winter clouds offer that strikes me time and time again. 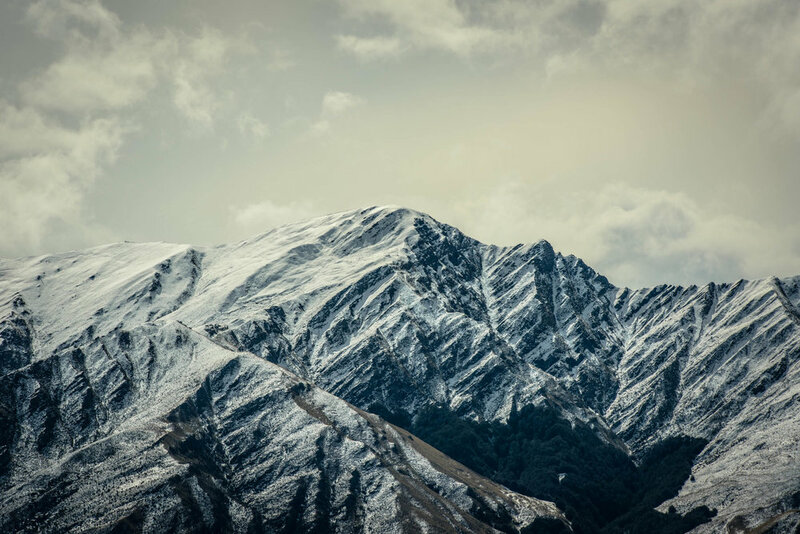 Often, it’s not the bigger snow falls, but those that tease us in terms of skiing, which bring the real contrast to the observable construction of the mountains which shadow our day to day existence. These giants that lie all around us, standing watch over our lives and activities, they are shaped from complex and rugged forms. As we stand downstairs gazing upwards we so often, especially during the warmer months, we miss out on see on what really makes them great. This dusting, reflecting the creamy light brings this into our attention. How can you not be transformed in your thoughts as you witness something so majestic? This colour palette and texture reminds of a fairytale of time gone by. The stillness of the water as it’s pushed down by the air hold mystery and intrigue. Is it really this calm, or is there something lurking underneath we are yet to see? The mist as it rises from between the ridges, nestled within the gulleys leading up from the water's edge, tell me that the temperature is rising. The moist mountain sides are slowly but surely beginning to release the water from their surface. We can start to gauge a depth, some form of distance to the vista laid out before us. The jagged forms dance around each other giving rise to thoughts of how they were created. What exactly did happen thousands of years ago? The peaks in the foreground appear to be huge, yet would be dwarfed by those in the distance. The clouds descending from above hide their height and the vague light which does pass through reveals only snippets of what lies beneath. As always we can stand here and look, question the value of our own existence in the grand scheme of things. We are so young, so small, yet here we stand intelligent enough to be able to comprehend something so much larger than ourselves. To wonder in the history that is our place. Should it not be of comparison, but thoughts of integration, they are us and we are them. As the clouds merge with the land, so do we. If only we take the time to allow ourselves to stand still and become at one. After all, isn’t that what all great fairytales are about? I hear them called ‘God’s fingers’ yet I often wonder if they should indeed be ‘god’s fingers’. That must only highlight my own insecurities when it comes to defining my own faith. I have faith, for sure, what I don’t have is any one box to put my faith into that any other person wholly agrees with. When it comes to these rays of light though, I do agree with so many others. They are easily one of the wonders of the natural world. They whisk up from almost nowhere with no notice given. A total and utter surprise to those of us lucky enough to view. As they dance around they play with the light, highlighting just how bright it is above that main body of cloud. I can almost hear them calling, ‘catch me if you can’. As mischievous as a wisp their appearance signifies something special to me. I’m not 100% sure exactly what kind of special. Just like my faith, it’s not a quality than can be defined or quantified, just deep inside of me, when I listen to the way my heart sings, I know it sings with joy and passion. When I see these fingers stretching down to touch the Matukituki Valley I feel like I’m home. I’m not sure if I should say this or not, but I’m sure you’d be able to work it out for yourself if I didn’t, so what does it really matter? The Peninsula, in my opinion of course, is the unsung hero of the Lake Wanaka Landscape. Unlike its little cousin ‘That Damned Wanaka Tree’, the peninsula can be viewed from many different viewpoints. What most people don’t appear to appreciate is that its aspect is almost as perfect as it can be to make the most of the sun in the later half of most days. That is of course when the storms allow the light to penetrate through to its surface. She rises abruptly from the water's edge, then mellows as she ascends. Her cloak is one of varied vegetation. Trees and shrubs from the greens. Grasses and sandy bluffs add to the gold. And her form, the gentle varied ridges and gulley’s bring in the shades. Often she stands out of the main force of the storm, catching the light, as she does right now, contrasting against a dark gloomy backdrop. She is a stronghold of our place, the unsung hero standing guard offering protection and beauty as the waters of the lake begin to form the body of Mata-Au. Here we go again. Another of these glimmers of hope. As we enter the winter months and the snow begins to fall, it’s as though it’s required for the light to dance in all its glory. Not just once, but numerous times in each and every hour, each and every day. Set against the backdrop of the very remarkable Remarkables, it sings out with joy, colour and hope. Breaking through with strength and courage as it lands upon water starved land glimmering in gold. Words will not add any more to this image, it’s one to stand back from and absorb with all you have. What can you say? One of those times we almost drove straight past. Towards the end of a seven hour drive. However bowing to the opinion of the car I paused. There's a lesson that if theres a chance of a shot you should always pause and take the time. You might not get the same chance again.